Visible Ink Press : This superhero has a green face and is kind of like a Warner Bros. cartoon character gone bad. This superhero has a green face and is kind of like a Warner Bros. cartoon character gone bad. He first appears on the scene as the alter ego of Stanley Ipkiss, though other humans assume his mantle in other stories. While in comic books his shenanigans often proved lethal, in the film version in which he is played by comic Jim Carrey, no one is killed. His powers come from an ancient object once owned by the Norse god Loki. Superheroes have always offered vicarious empowerment to the average, the meek, and the disenfranchised. When orphan whelp Billy Batson transforms into the mighty Captain Marvel by shouting "Shazam," for example, one thinks, If only I had such a gift. Stanley Ipkiss might disagree with you. This human doormat is the lowest of losers--until he buys an ancient mask in a curio shop. Donning the eerie visor, he is transmogrified into a mischievous oddball with a green cranium and a devilish, toothy sneer--plus malleability, invulnerability, and the power to pull objects (especially weapons) out of thin air. 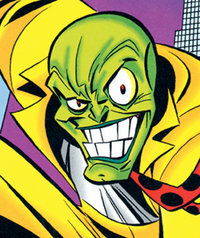 Meet the Mask, or "Big-Head," as he is known in public, who embarks upon a mission of revenge against his tormentors. Premiering in Dark Horse Presents #10 (1987), the Mask is a vengeful, human Bugs Bunny with an "R" rating--unlike that "wascally wabbit," however, when the Mask blows up someone, he or she stays dead. As the body count increases in Big-Head's wake, resolute cop Lt. Kellaway is determined to stop this crazy killer, and the heat is on hapless Ipkiss. The Mask was envisioned by Dark Horse Comics president Mike Richardson, writer Randy Stradley, and artist Chris Warner, but given life by writer John Arcudi and illustrator Doug Mahnke. Dark Horse published multiple storylines featuring the mask (the object) falling into the hands of (make that onto the faces of) a variety of people, with the moral to the story (if there was one) being, vengeance carries a price. Each person who has worn the mask has been intoxicated by its power, but eventually beset by disaster. From his Dark Horse Presents appearances the Mask clobbered his way into a four-issue miniseries titled Mayhem (1989), then into a succession of miniseries and specials all his own, including The Mask (1991), The Mask Returns (1992), The Mask Strikes Back (1995), and The Mask: Toys in the Attic (1998). A nonlethal, kid-friendly version of the character became a movie icon in The Mask (1994), a box-office smash starring rubber-faced comedian Jim Carrey as Ipkiss/Mask, and featuring a scene-stealing dog named Milo. The Mask is also noted for its breakout performance by Cameron Diaz as a femme fatale turned Ipkiss' love interest. A hefty special-effects budget brought to life the Mask's implausible Looney Tunes-inspired antics, and Carrey (in the role) coined a short-lived catchphrase: "Ssssmokin'!" A spate of merchandising accompanied the film, and Son of the Mask made it to movie houses in 2004. The Mask, promoted as "From Zero to Hero," spawned a television cartoon spinoff (1995-1996) in both syndication and on Saturday mornings, which in turn inspired a Dark Horse comic book in the "animated" style, Adventures of the Mask (1995-1996). Other animation-based and traditional Mask comics followed for a few years, including a four-issue Dark Horse/DC crossover teaming Big-Head with Batman's arch foe in Joker/Mask (2000).